:: Peanut Press Creative ::: Happy Holidays! Happy Holidays!! Well it's that time of the year for holiday cheer! I've been neglecting my blog...sorry! One of my New Years resolutions will be to get back into a rhythm with that! I've been busy trying to get things up and running on Etsy (stay tuned in 2012 for my shop to be up and running hopefully! ), crocheting and I've been keeping busy crafting for the holidays! Here's a little goody I put together for some of our friends for the holidays. 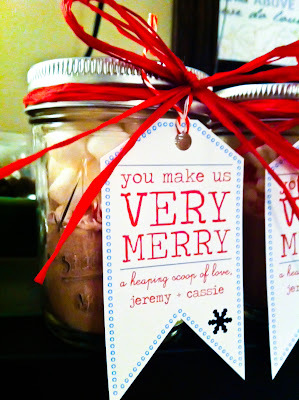 They're little mason jars filled with hot cocoa mix, crushed candy cane & marshmallows - easy and fun to make. You'll see our holiday tags attached too! Here's to a Happy Holidays & a wonderful New Year! I loved this Cassie! You are such a ball of creativity!